We’ve seen that any complex number can be written in the form z=r e iθ , where r is the distance from the origin, and θ is the angle between a line from the origin to z and the x -axis. This means that if we have a set of numbers all with the same r, but different θ ’s, such as r e iα , r e iβ , etc., these are just different points on the circle with radius r centered at the origin in the complex plane. Now think about a complex number that moves as time goes on: z( t )=A e iωt . and see that the point z=x+iy is at coordinates ( x,y )=( Acosωt,Asinωt ). The angular velocity is ω , the actual velocity in the complex plane is dz( t )/dt. d dt A e iωt = d dt A( cosωt+isinωt )=iωA e iωt =iωA( cosωt+isinωt )=iωAcosωt−ωAsinωt. Exercise: what are the x and y components of this velocity regarded as a vector? Show that it is perpendicular to the position vector. Why is that? so differentiating the exponential is consistent with the standard results for trig functions. d 2 d t 2 A e iωt =− ω 2 A e iωt . 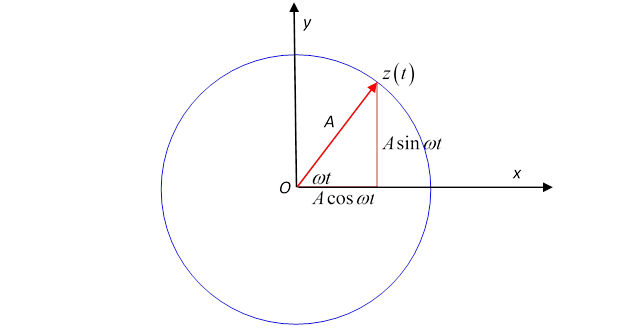 Again going to the picture of a complex numbers as a two-dimensional vector, this is just the acceleration of an object going round in a circle of radius A at angular velocity ω, and is just A ω 2 towards the center of the circle, the familiar r ω 2 = v 2 /r. Thinking physics here, this is the motion of an object subject to a steady central force. This is just the x -component of the circling motion, that is, it is the “shadow” of the circling point on the x -axis. Forgetting for the moment about the circling point, and staring at just this x -axis equation, we see it describes the motion of a point always having acceleration towards the origin (that is, the minus sign ensures the acceleration is in the opposite direction to that of the point itself from the origin) and the magnitude of the acceleration is proportional to the distance of the point from the origin. In fact, motion of this kind is very common in nature! It is called simple harmonic motion. m d 2 x d t 2 =−kx. This is exactly the equation of motion satisfied by the “shadow” on the x -axis of the point circling at a steady rate. The general solution is x( t )=Acos( ωt+δ ) , where a possible phase δ is included so that the point can be anywhere in its oscillation at t=0.